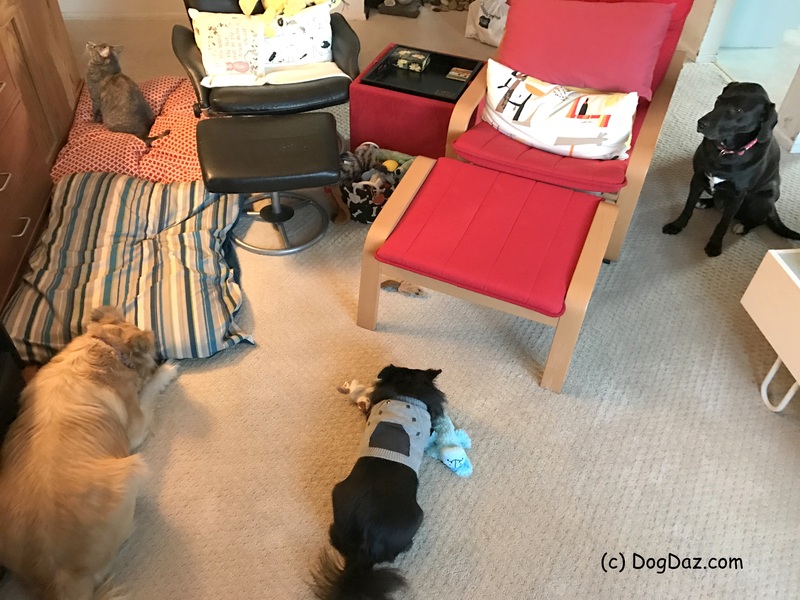 A rare capture of the 3 dogs and Mini Cooper in the living room. Starting bottom left, counter clockwise – Sofie is gnawing on her bed. She doesn’t tend to lie on it, but, as you know, she aways has to be gnawing on something to feel secure. Charles is hoarding all the toys that were on the floor. He really has been liking the big dog’s flat unstuffed animals. Here he has a ‘cat’ cat toy and Louise’s big blue flat dog. He actually enjoys nibbling on the stuffies for a good while. Louise is supervising. She doesn’t play much unless I am on the other end of a toy or there is food in it. Mini Cooper is getting ready to do her usual high jump in front of the big fish tank. You can find her flying high in the air quite often. I think she is trying to give the fish a heart attack (lucky they can’t have them). She likes to sleep on that particular dog bed too. I think mostly because that is Louise’s preferred spot. The cats all like the big dog beds (even Noel sometimes). Interestingly, I have not seen Charles try any of them. Maybe he knows that Sofie gets possessive of anything that ‘might’ be hers, or maybe it is because his ex-pen is right there with his bed from the shelter, or because there is another one on the couch (spoiled new comer that he is). Yes it is. Makes for interesting times. Big family. 28 paws. And very happy, thanks. Until someone gets stupid. But you’re learning that. Sharing is not as easy or fun as human’s make it our to be. We wish we had a fish tank to sit in front of.